My spies tell me that due to the success of their last golf tournament held at Amarilla Golf Course Oasis Fm, the British South Tenerife based radio station, are considering holding another tournament in December this year. I missed the last Oasis Fm tournament due to other golf commitments, not like Joe Ferguson who’s only lame excuse was that his lovely wife was in labour, but I will try this time to play in the event as they all seemed to have so much fun last time round. So if it’s on lads and December is the Date let me know so I can pencil you in ….. 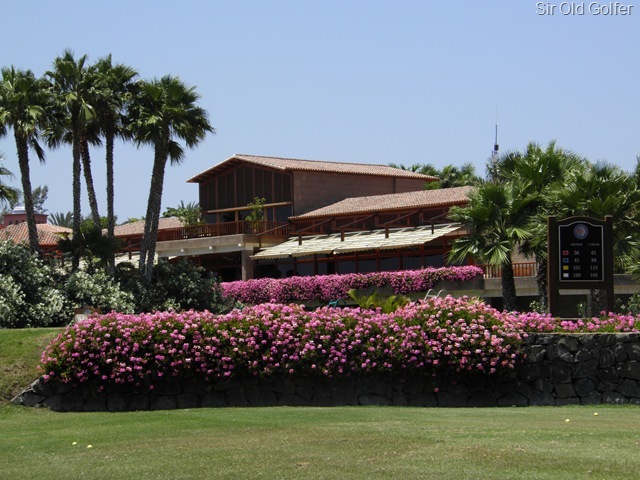 This blog written by Sir Old Golfer ” The Golf Ambassador to Tenerife” from his beautiful home in Tenerife overlooking the ocean in Golf Del Sur just a few minutes drive from Golf Del Sur Golf Course where he lives some 9/10 months of the year. He also has a home on a golf course in Alloway :Ayrshire: Scotland ( Birth place of poet Robert Burns) on the famous west coast Golf area of Scotland, famous for Turnberry, Troon and Prestwick golf courses. He himself was a member of Turnberry Golf club for many years also a member of Glasgow Golf Club. By all accounts a very handsome chap indeed ! Sir Old Golfer is a Golf sports writer who’s only interest in life at his age is to play as much golf as possible and write about it when its dark, he still plays to a 5 handicap in local club competitions most weeks and is the Golf Del Sur Golf Club Champion 2008/2010. He spends a lot of time playing in golf tournaments on the Island and especially enjoys the Circuit Tenerife-La Gomera an event spearheaded by the Tenerife Golf Association which allows amateur players to play competitively on all the championship courses on the island. Just one of my Lovely Offices ! He is compiling this Blog to allow others who love Golf and Tenerife as much as he does to share his passion and times on the fairways. The older I have become the better a golfer, in my mind anyway, I used to be ! Read my latest Golf Book : Chapter by Chapter Here…. I hope you all enjoy.. So here I am off again overseas to play golf, one of the drawbacks of living on an island, but this time I am really looking forward to it as I will be travelling by Fred Olsen Express ferry rather than by plane as I am going to La Gomera , a small island off the West Coast of Tenerife, about 40 min by Olsen fast ferry. Fred Olsen runs the ferry service to the island from Los Cristianos in Tenerife , you may have seen their big yellow ferry’s in the harbour at Los Cristianos to San Sebastian in La Gomera,, The golf course we are going to play and hotel of Jardin Tecina is also owned and operated by Fred Olsen SL. as you would expect from one of the Islands foremost companies both are amongst the best in the Canaries. Don’t take my word for it have a look at the Jardin Tecina Web site and you will see the views and condition of the Golf Course are second to none with the hotel built in a village style which complements the islands beauty but has all the requirements of the most concerning clients. This U tube Video gives you the experience that’s only 40 min away but out of this world if you love Golf. 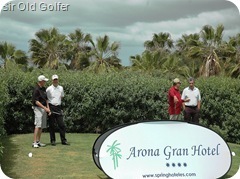 This is the fifth match in the 1vTenerife and La Gomera Golf circuit is being played at the Tecina Golf Course on Saturday 7th August 2010. The circuit over the years has went from strength to strength due to the work put in by the Golf Association, the courses themselves and the sponsorship of the many Island based companies who all help make the day run smoothly and that all the participants have a fun day out. The circuit this year is also open to both residents and holiday makers alike and for just 50 Euro you get a round at the championship course , the presentation of prizes, refreshments and a great opportunity to mix with the locals and tourists who both have one aim in common ..to enjoy good competitive golf on a championship course in the Sun..
Hotel Jardin Tecina and Tecina Golf are offering a special rate to circuit players and partners of just 49 Euros per person per night on a half board basis, single person supplement of 15 Euros is applicable and bookings are subject to availability. 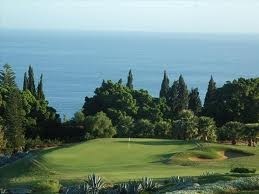 The third of the 1vTenerife and La Gomera Golf circuit is being played at Golf Del Sur Golf Course on Saturday 10th July 2010. I will be playing and hopefully I will play a little better than I have done so far this year on the Circuit. The circuit over the years has went from strength to strength due to the work put in by the Golf Association, the courses themselves and the sponsorship of the many Island based companies who all help make the day run smoothly and that all the participants have a great day out.